Sparkling Sunday Brunch is an event that took place on 29-Jan-2006 in Hyderabad. Dine in the enchanting Paradise lounge and feed on celestial food. Well, atleast it sparkles like that at the Sparkling Sunday Brunch of Taj Residency. This massive feast will certainly outlast your appetite, at 25 dishes in the main course alone. Unlimited beer and sparkling wine are a part of the brunch, justifying the name better than ever. A choice of around 20 salads gets you to a crunchy start, accompanied by soups and mocktails, as much as you can guzzle. Indian, Chinese and Continental fare jostle for staying power on your taste buds. Then there are Sushi and Kauswe stations for the exotic touch. 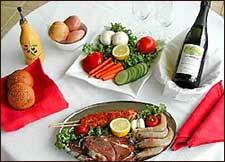 Smoken salmon, oysters, chicken, tender lamb and tons of other dishes thrown in make sure it is a virtual fair. When you are ready to crash out after heavy-duty feasting, you can recharge with the glucose from some desserts which are – well – a lot more than just glucose! Getex, Rasmalai, Souffle, chocolate puddings, halwas and more line up to sweeten your mood and give a fitting finish to your eating marathon. The buffet is priced at Rs. 595 + Taxes. For further details, please contact Paradise Lounge at 2339-3939. Be the first to comment on Sparkling Sunday Brunch! Just use the simple form below. fullhyd.com has 700,000+ monthly visits. Tell Hyderabad what you feel about Sparkling Sunday Brunch!